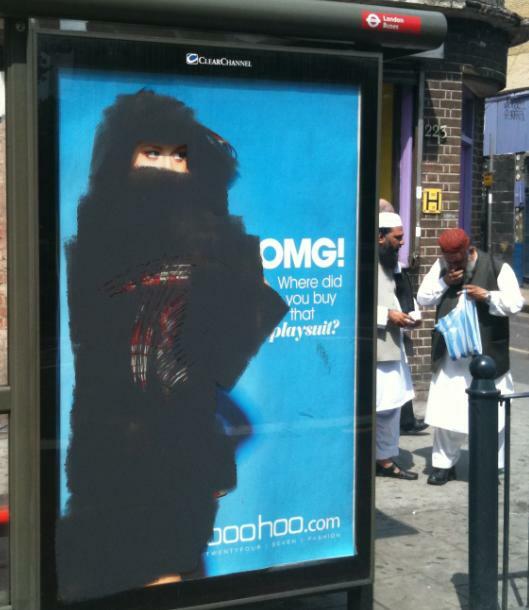 Painted Lady: OMG where did you buy that Burqa? Leonardo, seems to be back, took a hiatus maybe, went to ‘sarfend’ for a break, I dont know, but he’s back. Brightening up our day’s, daubing up every bit of female flesh that appears to be exposed, on bus-stops up and down the land, well at least up and down the East India Dock Road……….Sorry I got away with myself a bit there. Anyway this time hes Banksy-ied up the bus stop (east-bound) across the road from All Saints Church, next to the DLR station on East India Dock Road in Poplar. Thought that this had ended but it seems that ‘Leonardo’ is out there still. Passing along East India Dock Road, I noticed that his fine art additions to our vibrant community are still confusing the residents of Tower Hamlets. 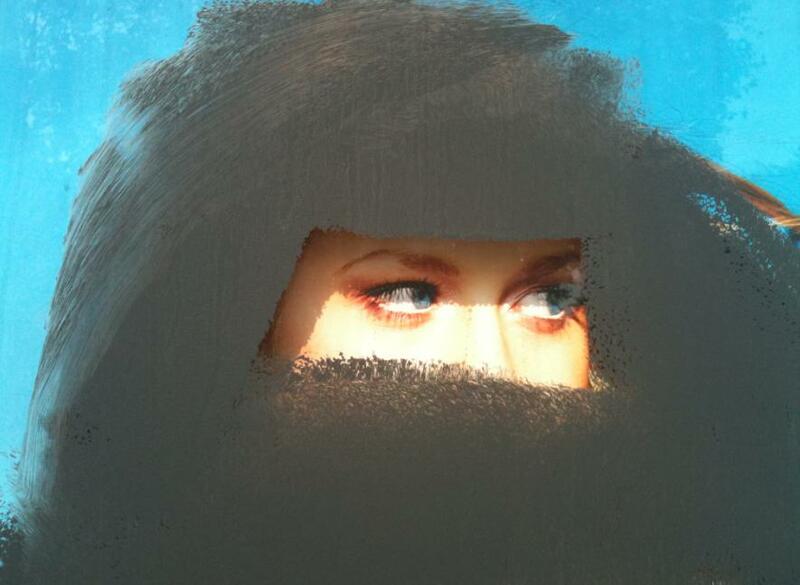 This time, it seems hes actually trying to paint what looks like a burqa over the female form. The game is still afoot, he’s definitely still out there, if you see him, or his fine art skills take a photo, or contact me and I’ll take one for you. 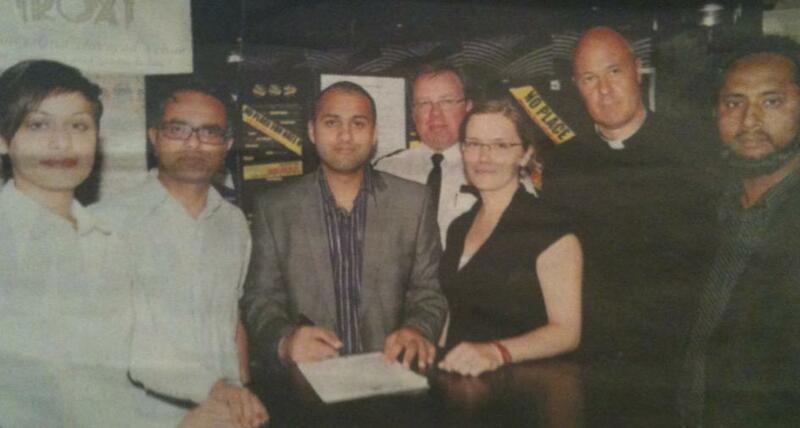 Whos really stirring up racial tension in Tower Hamlets at the moment? Is it the EDL who publically declared their protest against Extremist Hate Speech at the Troxy to be cancelled, when the council pressurised the venues owners to call off the event. Why are the Unite Against Fascism Groups, still calling a march that could inflame tensions in the East End? What really happened on Tuesday night at the Grave Maurice pub on Whitechapel Road? Were the EDL really there?, were these people really that stupid enough to really turn up with just 20 people and start attacking pakistani stall holders in the most concentrated asian heart of the entire borough? Just wondering if this is the same Dilwara Ali who stood as Respect Party Candidate for St Katherines Ward this year, and lost to two labour, and one conservative candidate. Now that would be an amazing coincidence wouldn’t it? Why are there no other reports from other sources regarding this ‘Dilwara Ali’? Surely an attack of this sort, that apparently inflamed local people to surround the Grave Maurice pub that day would have been reported in the local press? They punched Muslims, threw eggs and pork meat at Muslims. They have now gone into Whitechapel. If you live in East London defend your Muslim friends and neighbours in case the EDL attack. Headlines such as “EDL to Attack Tower Hamlets 20th June! What will you do? put out by MPAC (Muslim Public Affairs Committee) do nothing but inflame tensions in the borough. Even claiming that East London Mosque is to be attacked, some comments on blogs argued that text messages sent about during the day are even spreading vile filth linking the recent rapes of 2 women to the EDL. Tower Hamlets deputy Police Commander Colin Morgan said in a statement that: “There are rumours of anti-Muslim activity. But there is a big difference between what is actually happening and what people say is happening. The Poplar & Limehouse MP is accusing the organisers of using the EDL for their own propaganda when the danger has passed. So did anything really happen as the Respect Party, Unite Against Fascism, and members of other organisations claim? or are certain sections of the community just stirring up racial tension, for their own political purposes? I may or may not attend myself, but either way I just hope that the march goes by without any trouble, no one gets hurt, and the event hopefully puts an end to the recent tensions. The Troxy in Commercial Road has finally seen the light and bowed down to public pressure and cancelled the planned Islamic Conference that was cause of so much tension. In a joint statement Cllr Helal Abbas and Cllr Josh Peck said: “We called for the event to be cancelled because of concerns about the reported views of some of the speakers and the divisive impact it was having on our community. The EDL in the face of what the Troxy obviously now have also done the right thing, as they have lost their prime focus of the march and have decided to withdraw. Now all we need is for the UAF opposers to withdraw, and we can happily go back to things as usual. ‘Unite Against Fascism’ who were to march against the EDL (English Defense League) accusing them of links to the BNP have been silent on the whole affair of the conferences apparent links to extremism. I wonder why this is?, an organisation (UAF) that sets up a counter protest to oppose another organisation (EDL) for what they view to be the EDL’s use of hateful language and divisivenes in the community, do not seem to care that the EDL protest was itself a protest regarding the apparent use of hateful and extremist views at the now cancelled event at the Troxy on the 20th June. The organisers of the event the UK-IC still plan to go ahead on the same date, at the same time, but are at present stuck for a venue (obviously). Two reporters from the Evening Standard have been trying to get in contact with me regarding my blogging on the painting over of women in advertisements on Bus-stops. Just got off of the phone with one of them, who informs me that todays edition of the Evening Standard is going to run a story regarding this vandalism. Although I’ve not noticed any other attacks recently, he told me that the Police are aware of the situation, and that so far there had been around 14 of these incidents. Now I’m not too sure of what he means by this, but I do know of the controversy surrounding the movie ‘Kites’, hailed as the first truly big blockbuster bollywood movie. The Asian Tribune as well as a vast number of asian blog sites are highlighting the fact that screenings of the film at cinemas across the Indian Sub-continent have been stopped because of the fear of reprisals. Some are even calling for reverse boycotting of ‘Tamil’ led films. If this is what the reporter I talked to is referring to, then I disagree. Maybe a small number may be to do with this boycott, but its not just the Kites film posters that are being painted over. In Tower Hamlets this seems to be something far different. Anyway read todays Evening Standard, I maybe wrong but I think the reporter said they may be using a quote from my blog. 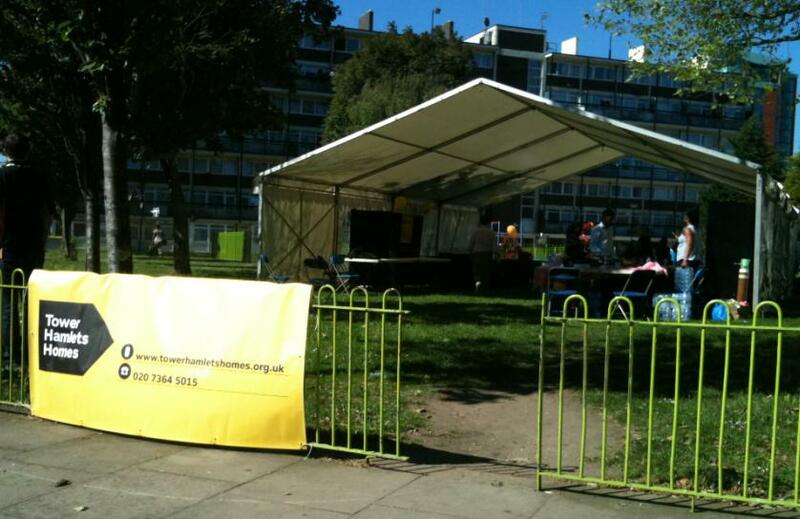 Anyone else interested in these blog articles should click the ‘Painted Ladies’ catagory on the right -> where all of the articles will be neatly placed on the same page..
Tower Hamlets Homes has employee ‘fun day’ at venue hosting controversial conference. 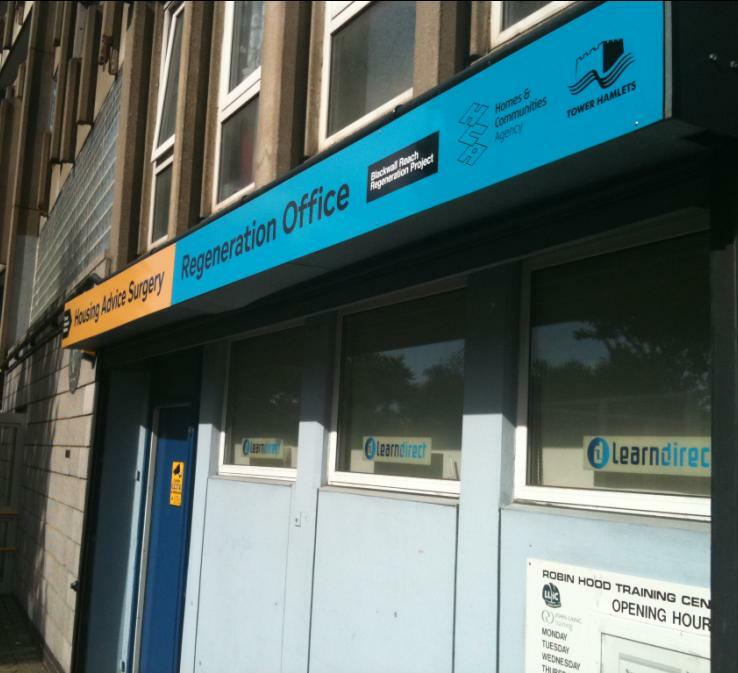 Tower Hamlets Homes (sources inform me) are so impressed by the newly refurbished ‘Troxy’ in Commercial road that this Wednesday 9th June, they are hiring the place and every member of Tower Hamlets Homes is to attended a ‘staff conference’ there. As this conference is for every employee, then essentially this Wednesday ‘Tower Hamlets Homes’ is being shut down providing none of its promised services, as the conference is going on from 9 to 5. But how really commited are the first commercial signatories (The Troxy) to the councils ‘No Place for Hate’ campaign?. Ted Jeory on his blog over at ‘trialbyjeory.wordpress.com’ has alluded to the fact that there seems to be trouble brewing for the Troxy. His article ‘The art of persuasion’ has highlighted that on June 20th 2010 a conference is be held there that will provide a platform for speakers that some think highly controversial, even bordering on Hate-speech. The very thing that this venue and our council have signed a pledge to stop. Read Ted’s article, and the links to the ‘Harry’s Place’ blog article that he links too. Harry’s Place blog, goes itself into detail about two of the speakers; Bilal Philips and Hussein Yee. “It seems that none of this matters to the managers at the Troxy. If the police do not intervene, they will allow the event to go ahead. The police are not likely to act. Nor should they in this case, in my view. Informing us that these type of events can be cancelled through people power, or at least curtailed to weed out people who’s agenda’s may inflame a borough with such diverse and at times volatile history. I would go further though and threaten to publicly humiliate the owners of the ‘Troxy’ into withdrawing their support for this conference, by threatening to remove their signature from the ‘No Place For Hate’ pledge in a publicized event outside the venue. 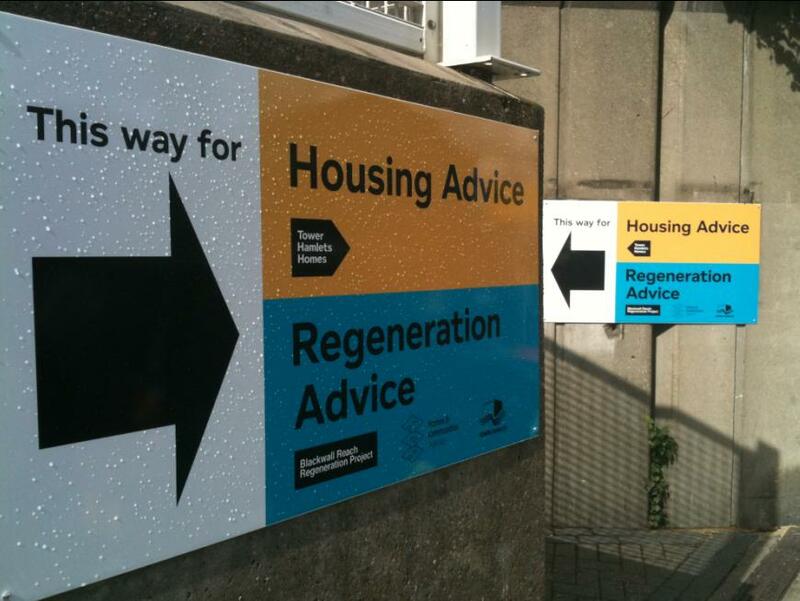 With Immediate effect, Tower Hamlets Homes should cancel their own ‘Staff Day’ this Wednesday, as the controversial June 20th event could have an unforeseen backlash in bad publicity on themselves. For all of the Hate Crimes statistics reported in this borough, which I wrote about just recently show that although the diversity of this borough is something that should be cherished and encouraged as a form of symbolism of what can occur when people of different nationalities come together, that we still have a dark underbelly to our local culture. The need for the ‘No Place For Hate’ campaign only solidifies this problems of Hate Crime within the borough, and yet allowing venues to provide platforms for so-called ‘Hate Preachers’ at venues that the Coundil hold Anti-Hate rallies comes across as extremely hypocritical. This form of hypocrisy is the most dangerous, and could lead the borough into having to deal with some unpleasant fall-out, that endangers people’s lives. I’m sure none of those present in the photo above realised that this venue would harbour these type of events, and if what they purport to represent, then in my opinion they should remove themselves of all support for this type of segregation of communities. The other dangers are that this ‘No Place For Hate’ campaign by the council comes across as nothing but ‘words’ and ‘signatories’ something to make the borough look good, but is nothing but empty promises. Something for people in elite circles to have their photo taken at, that supports their own self-interests, while residents in this borough are getting attacked on a daily basis. All profiting on others misery, while our principles are sold to the highest bidder……. Bumped into an event today in Pennyfields in Poplar. A chinese looking lady who i now know as ‘Peggy’ was sitting cross legged underneath the window of an Estate Agents in Birchfields Street. She was approached by two policeman who asked her what she was doing there? The Police there told her that she couldn’t sit there because she was blocking people from entering the shop. They went on to tell her that it was illegal to sit here as it was a hazard to passers by, and that if she didn’t move she would be arrested. One of the police officers went into the shop after ‘Peggy’ told them what was going on, and was in there for several minutes. He then came out and told her that she would have to remove herself from the area completly, not just from outside the shop but entirely from the scene. I could not see anything wrong with what she was doing. She was peacefully sitting there, not shouting, but just informing people that this shop basically stole her money. She was not blocking their entrance, and was sitting just under the window, quietly informing them of her experience. I’m not a lawyer and do not claim to know the law, but being asked to completley leave the area seemed a bit over the top. 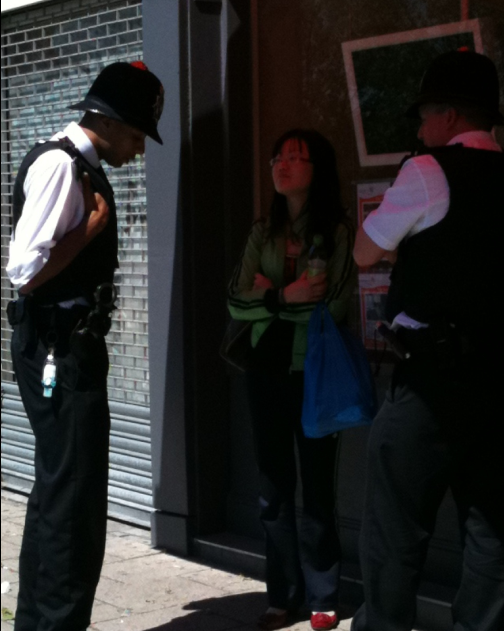 She quietly pleaded with these Policemen that she didn’t think they were right to ask her to leave, but they insisted. Another Policeman turned up on a pedal bike, and then two more community police officers. Still ‘Peggy’ remained extremely calm, but obviously upset about the whole situation. She begrudgingly left the scene walking towards Limehouse. in a chinese accent, and felt extremely sorry all of a sudden, for this lady, that no-one seemed to be on her side. I found ‘Peggy’ to be pleasant, if not a little upset about being treated in this way, first by the loss of money, and then by the Police. She then asked if I knew if this was right or not. I replied that I felt that this was completly wrong in my opinion, that I believe the police dont have the right to move you on like this. But then what do I know. In this day and age, a peaceful honest protest like this surely cannot be any harm to anybody. Why would the police take the side of a private shop like this?, when she wasn’t harming anybody or doing anything that I could see anyway, that could be honestly deemed illegal, and forced to leave the area? Anyway, we both left and said our goodbyes. Not to sound overly dramatic but my day felt a little heavier at seeing her walk out of the area. I turned around and the Police stood their watching her walk down towards Limehouse. Surely they had better things to do than stand there watching her walk the entire length of West India Dock road? Dont get me wrong I completly respect the police, but somehow what I witnessed today, just didn’t feel right. ‘Peggy’, I hope you find some peace to all of this, Karma sometimes has a way of catching up with the best of us.